Aaaaand I almost picked another one up at the thrift store yesterday. Aaaaand I’m always trying on blouses and long-sleeved shirts with leopard print…. Gah. Because if a cozy animal print sweater works once, it’ll work twice (or three times! ), right? You may not even need 2. In a world where style choices are pretty much endless and it can take a long time to figure out what works, it can be tempting to buy repeats of the same successful outfit. 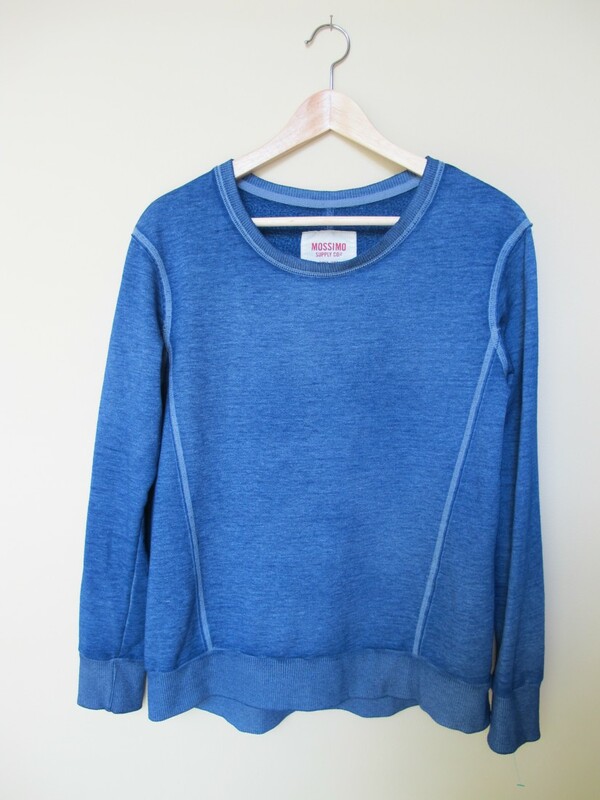 Buying quasi-duplicate (or even just relatively similar) pieces is comfortable, safe, and easy. But will you really wear a sliiiightly different pair of grey jeans as often as you do the first pair you fell in love with? And if you’re striving to create a curated wardrobe using a limited amount of items you love to wear, why waste the chance to introduce critical variety into your repertoire by loading your closet up with similar looks? Keeping the leopard print sweater above is not only going to read similarly (ahem…boringly) in my style lineup, it’s also going to eat up valuable wardrobe real estate that could be used to liven things up with a fresh color, cut, or pattern. 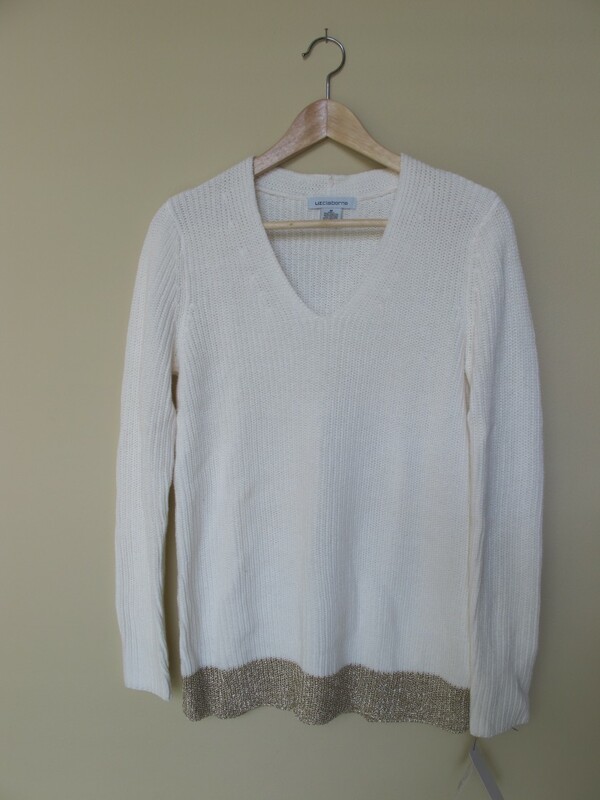 White and gold sweater by Liz Claiborne, new with tags – this is the first Liz Claiborne piece I’ve found that has fit me – my body type is not their target demographic, which may explain why it gives me some cuuurves! 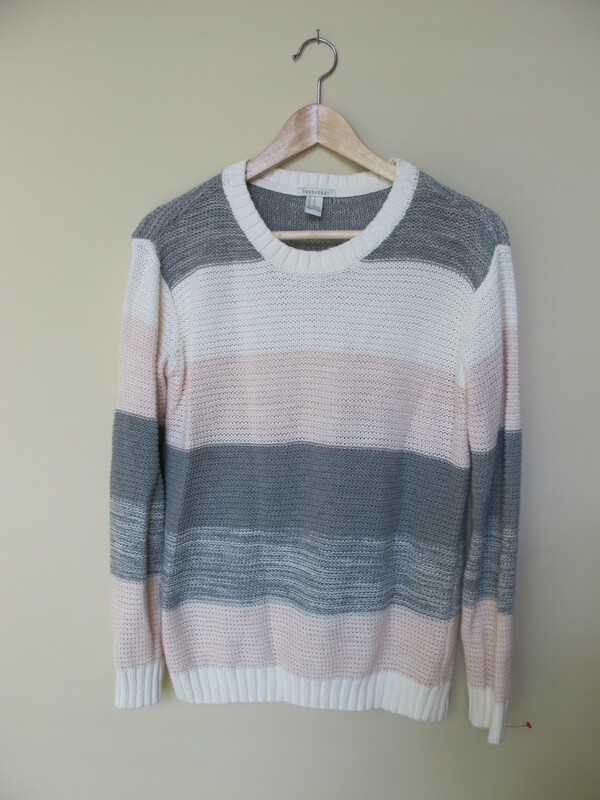 Oversize blue stripe sweater by Liz Claiborne (the one on the LEFT in the pic) – it is SO soft (100% cotton) and the colors Just. Make. Me. Happy. I guess I’m a Liz C. convert now, at least in the sweater department. I *think* it’s going to style well with my new slimmer winter pant silhouette and some dressy jewelry to keep it from feeling too casual/sloppy, but I’m honestly not sure how I’ll feel about it. (This is the peril of restyling an off-season wardrobe. LINK) Fingers crossed! 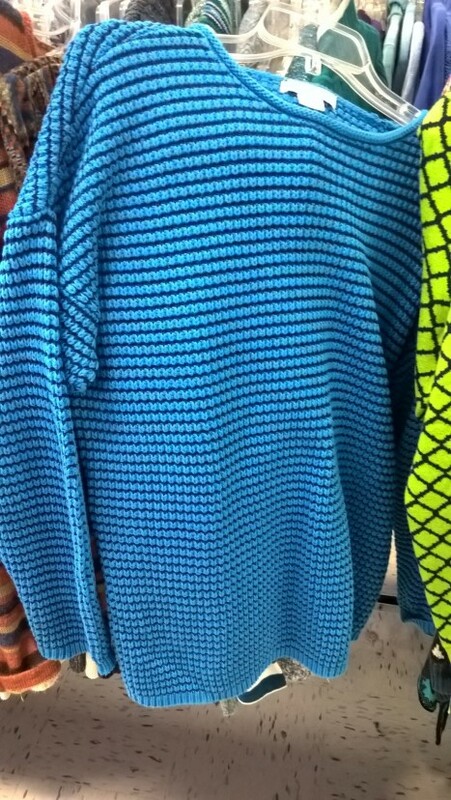 In these new (to me) picks, you can see echoes of the same general palette as the white/grey snow leopard sweater I love, but there are also new colors (blue, pink, gold) and new silhouettes (a little boxy in the blue; v-neck curvy in the white/gold one; oversized in the blue stripe) that add variety and versatility to the sweater + slim pants vibe I’m trying to rock. Now that I’ve found more diverse sweater territory to inhabit, I feel like I’m getting more bang for my buck style-wise. Pairing each of these sweaters (and the snow leopard print one) with the 3 winter pants I’ve selected will give me a much greater range of looks than 2 or 3 animal prints plus those same pants would. As you can tell from my opener, I still have to remind myself “NO” whenever I see a leopard print sweater…AND, now, whenever I see a pink or gold/white combo, since it seems like my brain naturally attunes itself to home in on what works (see initial problem above). I may be having tiny regrets about a French Connection gold/cream windowpane number I passed over…but I’m staying strong! If you have a silhouette or color palette that works for you, by all means, stick with it. But think about how you can introduce variety within those parameters so that everything you own doesn’t feel the same. ‘Cause unless you are Matilda Kahl, sameness is the sure route to sartorial boredom – which leads, eventually, to dissatisfaction, that most contentedness-sucking, wallet-emptying of emotions. Where have you fallen prey to “I’ll buy just one more black dress, this is so cute…”? How did you break the habit? Or are you happy to wear very similar pieces all the time? Scroll down to share! PS Would y’all be interested in a sneak peek of my newly restyled winter pant selection, too? I can imagine that you Northern Hemispherites might be sick of seeing winter clothes during these hot summer months, but you Southern Hemisphereans might be happy to see clothes that work for you now, so let me know! ← What I Wore: Flared Blue Dress + White Denim Jacket + Leopard! Thrifting is certainly a great way to diversify a wardrobe (a.k.a. experimenting) for a low price! BUT . . . for me trying out new looks, styles, and colors is a double-edged sword: what I love in the dressing room doesn’t always make it in “real life” and may end up feeling like wasted time and money! My REAL problem is finding something really perfect and wearing it to death until, painfully for me, it becomes too worn out to wear (and then due to its Goodwill origins, it’s almost impossible to replace). Oh well, consider it the thrill of the chase . . . The blue sweater at the top of this lineup feels like that for me – it’s a stretch for me (a bit more athleisure? and with interesting lines that feel more structural/geometric than what I typically wear) and I’m not sure if it will make the lineup or will end up feeling “off.” I’ll have to wait until winter to see! I hear you on replacing favorites…I try to see it as a way to introduce something fresh into my wardrobe but sometimes you just want what worked before. Thanks for commenting! The tricky thing about all this is that there is no objective standard for “different enough.” Your snow leopard sweater is light in color and low-contrast, whereas the Gap leopard sweater was dark and high-contrast — plus they feature different neutrals (beige/tan vs. navy, right?). So I can imagine that for someone who really likes leopard print these would be distinctly different sweaters, even as I see why your desire to include variety in prints made you pass along the Gap piece. Same with the gold-hemmed white sweater and the gold/white windowpane: for someone with a very tight color palette (like a lot of the ones Janice creates on the Vivienne Files) those might be different enough, but I see why you want to include more variety in color. You hit the nail on the head – the *type* of variety you individually need is essential to the question. I love your point about the Vivienne Files and a tight color palette (or someone who sticks to a very tight silhouette pattern for example). Using Bridgette’s rule, I think similar items I purchase would have to be at least 50/50 with items I already own – that is, I’d want to wear the new item at least as often as the current item. I’ll have to pay attention to whether I can find anything like that in upcoming thrift hunts and how my theoretical standard plays out in reality. Thanks for commenting and sharing your insight! Do you find yourself getting new things for the winter/summer/whatever season wardrobe each year, to keep your style fresh? I wear the same work pants all year for years until they wear out. How much of the wardrobe do you keep and how much do you refresh? I’d have to think about the ratio, but it’s some of both. I just retired some pants that are getting whisper-thin and I may have to replace the 1 pair of jeans I own since after several years they’re starting to stay stretched in weird places. And I’ve worn my red chinos for years (fingers crossed they stay awesome for many more years to come!). I’m still in the transition to find my winter style, so there’s a big changeover from last year, and how long I keep these newcomers will depend on whether they turn out to be really “me.” I’d love to wear my new winter pants as long as the chinos and as long as you wear your work pants! For my summer wardrobe, I feel more confident in my style identity so I tend to keep things longer, but add/swap a piece or two for variety. Ideally it’d be good to settle into a style groove for both major seasons and then get to add in some variety for fun occasionally. I'm a thrift-vangelist, writer, preacher, family woman, and Midwesterner transplanted to New England (via 10 years in the South). My goal is to ignite and/or fuel your love of the THRIFT. Email me at leah@nullthriftshopchic.com with your questions and/or post requests! Enter your email address to subscribe to Thriftshop Chic and receive notifications of new posts by email.